Transportation From Montreal: We organize transportation from downtown Montreal to the ashram and return for CN$25. For most of our weekend seminars or retreats we prefer to collect everyone downtown at 6 pm, Friday, at the rear of the train station so please try to get a flight that will allow you to arrive in Montreal not later than 5 pm. Then you can take a taxi or the airport bus to 895 de La Gauchetiere West, in downtown Montreal, which is the rear of the train station and meet our driver Stephano (1-450-525-7318) who will be driving a dark Subaru station wagon, in front of the Tim Horton’s Restaurant. Do call us at 1-888 252 -9642 (toll free) when you do arrive either at the airport or at the rear of the train station). We have a supper at the ashram between 7 and 8 pm and an introductory talk at 8:30 pm. The first level seminar ends at 5:30 pm on Sunday. The 2nd level retreat ends at 4 pm on Sunday. We will arrange for your transportation to the airport, leaving immediately, but it will take at least 1.5 hours with the traffic, and you need to be there at least 1.5 hours ahead of the flight departure time, so do not book a return flight prior to 8:30 pm for a first level seminar and 7:30 pm for a 2nd level seminar. If there are no flights after that time, you will need to stay in a nearby airport hotel. There are many listed on the internet and they all have shuttle service to the airport in the morning. Otherwise you could consider staying over night here at the ashram if you bring a rental car or if early the next morning you take the direct bus to the main station in Montreal from the town Magog (which is 20 minutes away from the ashram, and where we can take you). It costs about Cn$27. But your flight on Monday should be late morning or afternoon if you want to do that. As there is usually no one driving back to Montreal on Monday, if you are contemplating staying over Sunday night at the ashram you would have to either take the bus or a rental car. There is a bus leaving from Magog at 6 am and 7 am Mondays and it arrives in Montreal main bus terminus 1 hour 45 minutes later. A taxi from Montreal main bus terminal to the airport takes 30 minutes. There is also an airport bus which takes the same time, departing every 30 mintues which costs about CAD$18. The taxi costs about $27. So if you took the 6 am bus Monday from Magog it would get you into Montreal by 7:45 am, and you could be at the airport by 8:30 am. 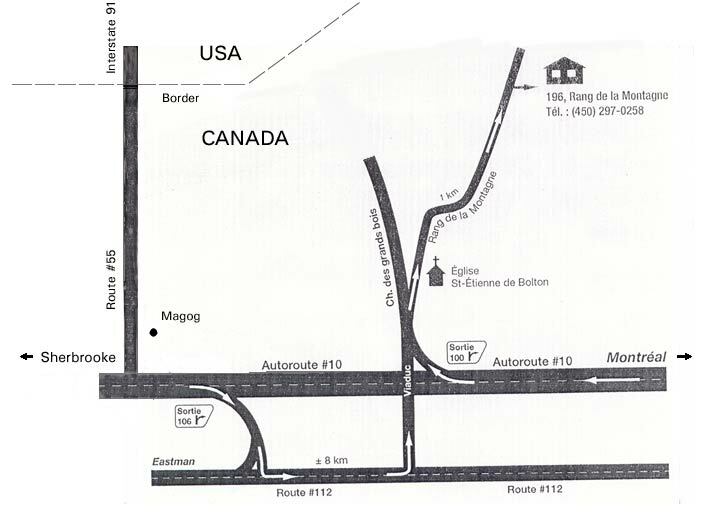 But do check the bus schedule Magog to Montreal at the website of the bus company www.limocar.ca. If you wish to arrive a day or two before a seminar, please come by bus from Montreal to Magog. Let us know in advance when you will be arriving at the airport, and call us at the ashram office number at 1-888 252-9642 (or Stephano at 1-450-525-7318 before you board the bus in Montreal, so we can pick you up in Magog upon arrival. Send to me at satchidananda@babajiskriyayoga.net your flight itinerary when you have made your reservations.